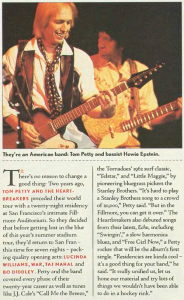 There's no reason to change a good thing: Two years ago, Tom Petty and the Heartbreakers preceded their world tour with a twenty-night residency at San Francisco's intimate Fillmore Auditorium. So they decided that before getting lost in the blur of this summer's stadium tour, they'd return to San Fran -- this time for seven nights -- packing quality opening acts: Lucinda Williams, War, Taj Mahal and Bo Diddley. Petty and the band covered every phase of their twenty-year career as well as tunes like J.J. Cale's "Call Me the Breeze," the Tornadoes 1962 surf classic, "Telstar," and "Little Maggie," by pioneering bluegrass pickers the Stanley Brothers. 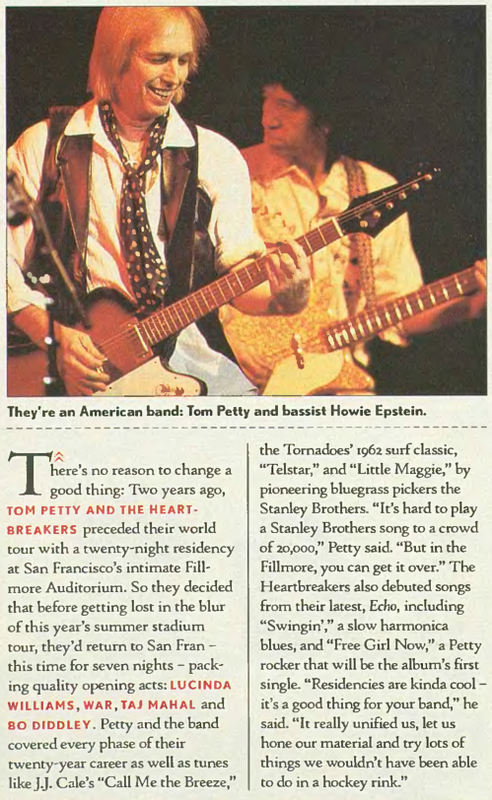 "It's hard to play a Stanley Brothers song to a crowd of 20,000," Petty said. "But in the Fillmore, you can get it over." The Heartbreakers also debuted songs from their latest, Echo, including "Swingin'," a slow harmonica blues, and "Free Girl Now," a Petty rocker that will be the album's first single. "Residencies are kinda cool -- it's a good thing for your band," he said. "It really unified us, let us hone our material and try lots of things we wouldn't have been able to do in a hockey rink." At a time when most rock veterans were stagnating, Tom Petty and producer Rick Rubin made Wildflowers, the most organic, cohesive record of Petty's career. 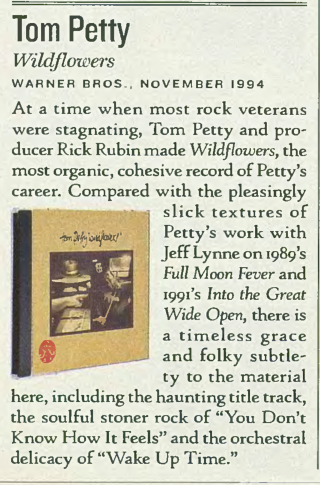 Compared with the pleasingly slick textures of Petty's work with Jeff Lynne on 1989's Full Moon Fever and 1991's Into the Great Wide Open, there is a timeless grace and folky subtley to the material here, including the haunting title track, the soulful stoner rock of "You Don't Know How It Feels" and the orchestral delicacy of "Wake Up Time."